KIEV, Ukraine -- Ukraine's prime minister, seeking to ward off Russian pressure, urged Moscow on Wednesday to accept his country's drive towards a new trade relationship with the European Union as a "reality". 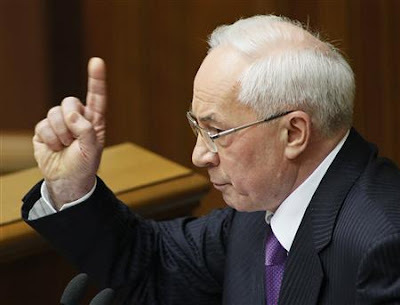 Ukraine's Prime Minister Mykola Azarov gestures during a session of the parliament in Kiev April 19, 2013. "The whole world is changing, the global system of economic relations. But to build a fence to protect yourself from changes using artificial barriers is simply pointless." Russian President Vladimir Putin said the Russia-led Customs Union, which also includes Belarus and Kazakhstan, might take "protective measures" to defend its markets. A Kremlin aide told Ukraine on Tuesday it would lose its "strategic partner" status if it signs association agreements with the 28-member EU bloc at Vilnius, Lithuania, in November. Ukraine's economy relies on exports of steel, chemicals and grain. More than 60 percent of its exports go to the former Soviet market, with Russia, Belarus and Kazakhstan the most important. For that reason, he said, "drawing up new dividing lines is not in the interests of our peoples." "In the same way, after signing the Association Agreement with the EU, Ukraine will create a free trade zone with the EU - this also has to be inevitably accepted as a reality," he said. Speaking in Brussels on Tuesday after meeting Yanukovich's point man on European integration issues, EU enlargement commissioner Stefan Fuele indicated the Tymoshenko question had been broached as well as Ukraine's progress on democratic reform to meet specific criteria laid down by the EU. "I have emphasized ... the need to ensure determined action and tangible progress on all the benchmarks set out," Fuele told journalists. In the near future Ukraine should conduct Ukrainian language modernization to exclude use of foreign words in the existing word base, and replace them with old Slavic words or modernized Slavic words which are most common for all Slavic languages. Also, conduct studies of Ukrainian dialects in the East, Mid Ukraine and West parts of the country to find best words which will reflect uniqueness of Ukrainian language, borrowing more from the central parts of Ukrainian speech to standardize the school books for all Ukraine. It is important that teachers speak correct Ukrainian. Out of ten speeches that I have herd as interviews of Ukrainian no more than two spoke proper Ukrainian. Born in Ukraine Don-bass region and currently USA citizen, Ihor Skakovsky. Born in Ukraine Don-bass region and currently USA citizen, Igor Skakovsky.